Amanda Sevall Designs: Wordless Wednesday: Yep, she sleeps with the doggie toys in the doggie bed! 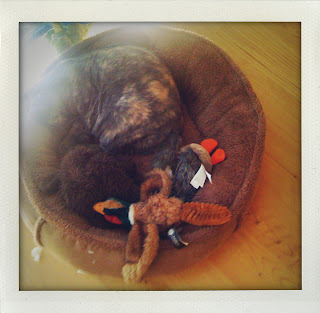 Wordless Wednesday: Yep, she sleeps with the doggie toys in the doggie bed! AMANDA!!!!!!!! How am I not a follower on your blog????????? Ok.. NOW I AM! lol! That picture is absolutely adorable!!!! Aww! She looks just like my kids. Tucked up with a favorite toy! So sweet.